Here I am, back again, to finish what I began yesterday! I wonder if it seemed strange to you all that I post a tutorial on how to make a leaf….. all will come clear today, I promise! High Tea was lovely yesterday! Oh I wiiiiiiiiiiiiiiiiiiiiiish I had taken my camera so I could have shown you the beautiful table covered in flower petals and the delicious cakes and fabulousness! Another time I’m sure! It felt like a faery tea party outside in the rose garden. Thank you *S*!!! I have to say, today I am sooooooooooooooooooooooooo excited to post…. Brace yourselves for much enthusiasm and many exclamation marks! I got a tutorial all ready to do this yesterday, but like I said, the weather was rubbish and so were my pictures. But I’m glad now, because the second lot are soooo much nicer than the first lot could have ever been, so yay for that. I told you a few posts back, that I had decluttered my stash, and sorted all of my wool into categories… consequently, I discovered some stash that I didn’t even remember I had. I kind of knew it was there, but not consciously! JOY! I call this sub-category of stash “luxury yarns” and I discovered my beautiful half and quarter balls of TouchYarn which is one of my favouritey-favouritist NZ yarn EVER. it is soft and delicious merino fabulousness. I never crochet with it because it is reasonably costly, so I knitted myself mitts, then stashed the rest of the ball, and ended up with a little bag of beautiful wool. When I was photographing this tutorial, I decided to get it out and use it, and wow…. what a difference it made the the end product! I love pointy petal flowers very, very much. Pointy crochet actually, and often modify flower patterns to make pointy petals, but then decided to have a play, and created a flower which let’s face it, is probably in circulation anyway, but it’s new and exciting to me! And so super-duperly easy too! So I’m going to show you how I made it today, theeeeeeeeeeeeeeeen, I’m soooooo excited about the second part of this post! Let’s get on with the tutorial. I used (as usual) 8ply wool with a 4mm hook, and this pattern is in American terminology. For a photo-tutorial on how to make a magic ring, click HERE. Now… here you change colour… so weave in those pesky ends right away(!) and bring the second colour through one of the first round loops. ch2 (counts as 1hdc) and into the SAME stitch, make the following stitches….. 1dc, 1htr, ch3, slst into 3rd ch from hook (picot made), 1htr, 1dc, 1hdc, slst into NEXT stitch. Did you fit them all in???!!! 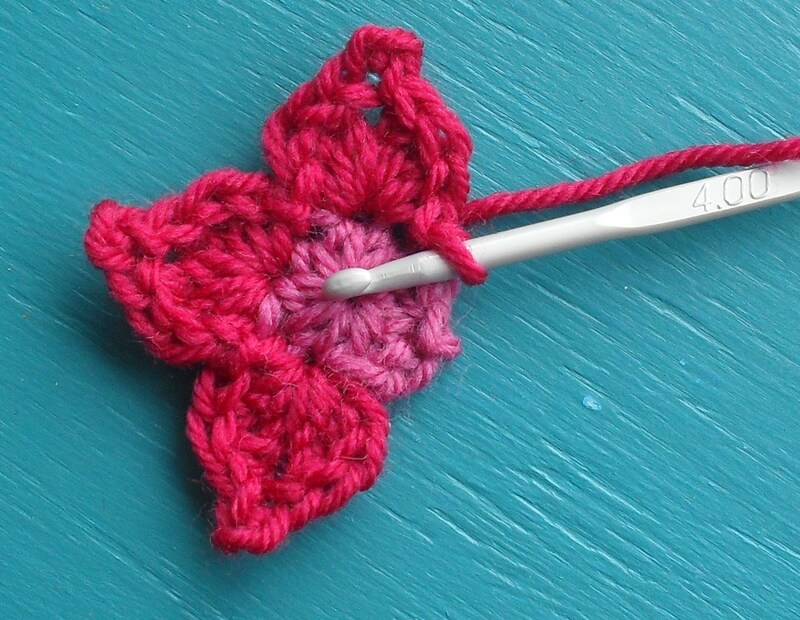 OK, so you’ve just made your slst into the second stitch, now make the second petal….. into the next stitch make 1hdc, 1dc, 1htr, picot, 1htr, 1dc, 1hdc, slst into next stitch. Continue around until you have five petals, each with a slst between them. Fasten off! 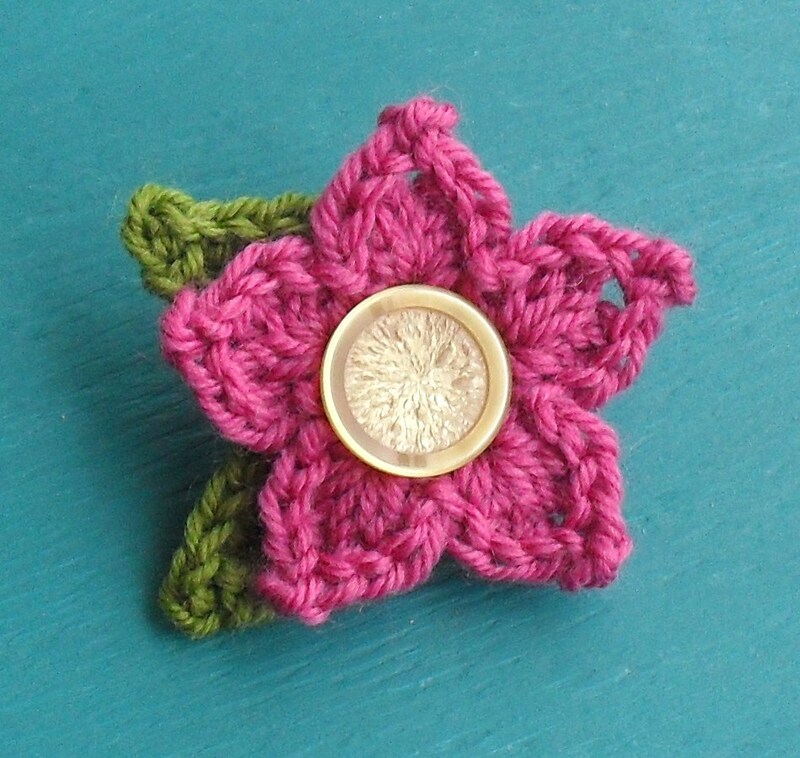 So the next part of the post is on how to make a lovely little brooch from this sweet flower! I made the flowers single colour for this adventure, so get yourself a flower happening, then make two leaves! (Ah ha! The purpose of the leaf is now clear!) You will also need a brooch back or safety pin, and a nice fun button. I thought I had a fantastic stash of vintage buttons until I went through the bags and bags of them and discovered 90% of them are BROWN! (I hate brown) But I managed to find a few fun ones to make some awesome and unusual brooches! To make the brooch, sew the button onto the flower, then sew the leaves together securely. They will form the back of the brooch, so make them nice and strong. Then, sew the brooch back to the leaves! 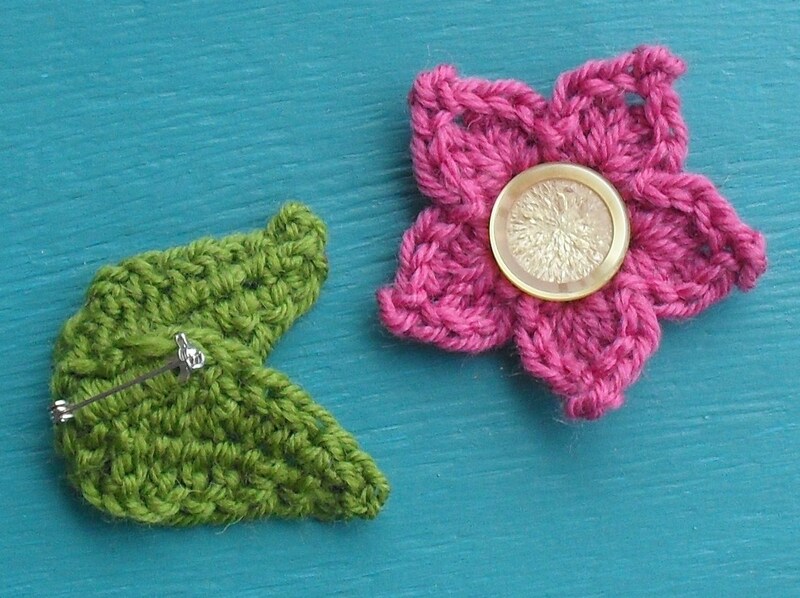 Next, with the same colour wool as the leaves, sew the leaves onto the back of the flower, making sure you sew into the BACKS of the stitches so none of the green shows through on the front of the brooch. Fasten off and voila! I think it’s fair to say that I am utterly enchanted with these pointy petal flower brooches, and I hope you love them too! I’m going to be making some for my handmade/NZmade 2011 challenge gifts as they are sweet little present fillers for when the present just needs a little something extra…. plus maybe one for me….. or two! If they are gifts, make youself a little label to make them professional too! Have fun making these! They will be such cutie additions to market stalls etc…. for those lovelies who e-mail me asking my permission to sell things I post on here, go for it! Make heaps! I hope you sell heaps too! Please, however, be mindful of continuing the sharing vibe! OK… I’m off… I’m still on holiday but I have assignments to do and I let myself post this as a reward for a morning of hard work. Reward time is over and it’s back to the books! This entry was posted in Crochet Flowers. Bookmark the permalink. first of all,happy new year to you!! hope the year is as filled with colour as your posts……with lotsa happiness!! absolutely love the flowers…they are so sweet,i can picture my lil girl wearing heaps of them. the possibilities are really endless,arent they/? she has .a pair of jeans that need prettifying an dthese will just do the trick, i think. thank you for sharing!!! good luck with the assignment…thank you for sharing the “sharing vibe”. Alice, you are always coming up with the cutest ideas. Having perfectly wonderful yarn helps! So pretty and cheerful. Thank you! I wanted to comment yesterday, but was reading on my phone, so I waited to come comment today on my laptop. I was going to ask how you knew that I was in need of a leaf pattern just like that one for a little project I am working on – and now I am going to have to start it completely over, I’m afraid. Your pointy petal flowers are just perfection and the rounded ones I have made already are just going to have to find some other purpose. Here I have been feeling rather guilty at it being Wed already and I am supposed to be working lots on this project this week and I haven’t even touched it. But now I know I was just waiting for your patterns. I can’t wait for my husband to come home tonight and watch the baby for me so I can start making some lovely pointy flowers and leaves! The flower is really cute and goes well with tat leaf! and indeed is really easy to make!! thank you fo the tutorial!!! I love your colorful blof, and your eye for colors! Oh, thank you for your lovely tutorial. I am a new crocheter, and I appreciate all the help, and the lovely sharing. Those pointy flowers are SO cute,Alice!! I’ll be making some soon. You’re so gracious to grant permission to sell items made from your patterns. What comes around goes around! I love them, I love them, I love them ! Thank you, thank you, thank you (I know, I’m repeating myself ! LOL). Thank you for sharing; thank you for bringing colours into our lives and wishing you a wonderful 2011 ! wow this is amazing how kind of you lovely Alice. I am making one today. 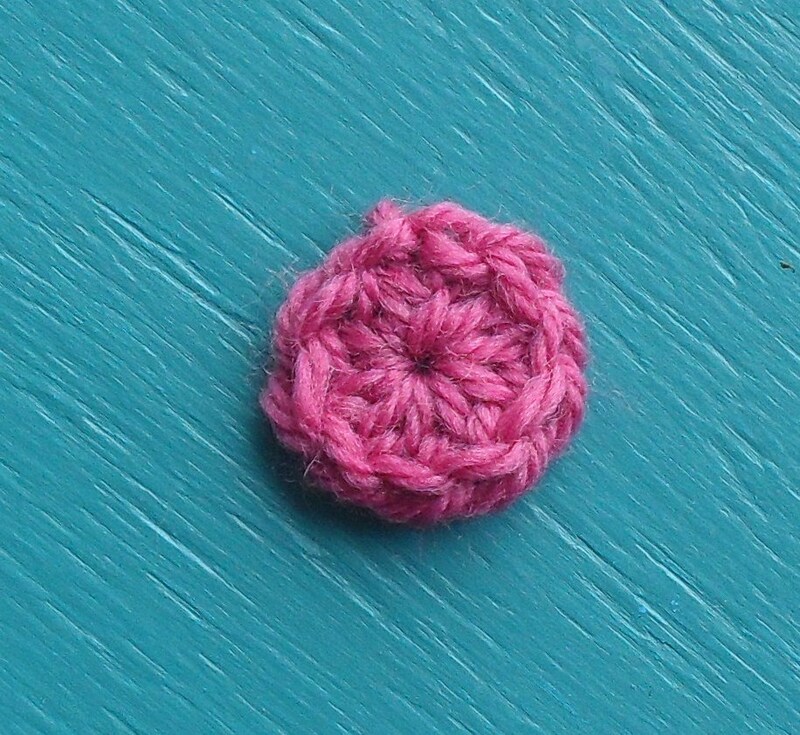 Oh how lovely… one of my very first forays into the world of crochet was making little flower brooches of various styles to give to people when I went to visit them, or for Mothers Day gifts etc. I don’t think you can ever go wrong with this kind of gift for someone special in your life. That being said, I think I may crochet up some of these flowers and use them in some kind of Spring decoration for my home as I can imagine them making it so bright and beautiful in here during the dark winter days we still have left to go. Totally sweet! 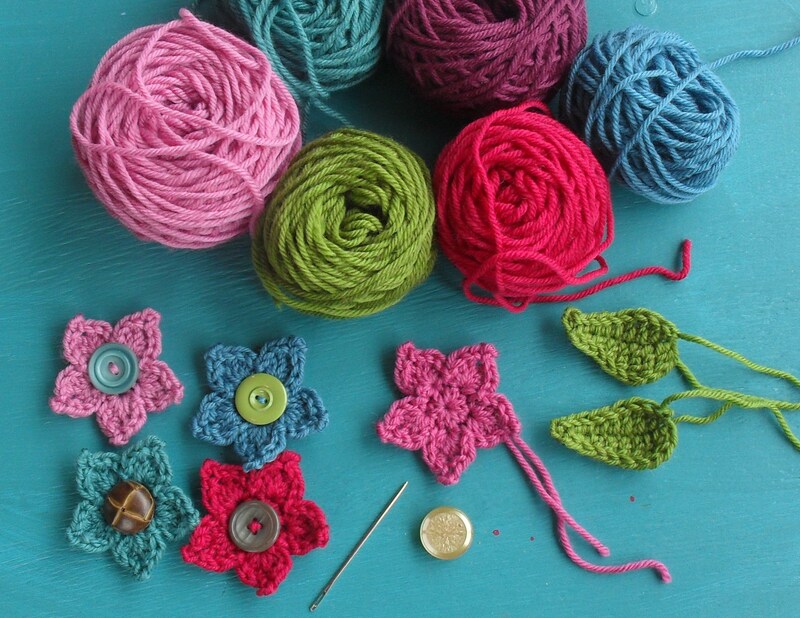 thanks for the tutorial, I´m sure I´ll crochet one of these cute flowers soon. A hppy new year to you Alice. These pointy flowers are absolutely adorable! I will try one today 🙂 Thank you for sharing the tutorial! Flower brooches are certainly in at the moment, I have made a few myself, mum got one for Christmas. I have been madly crocheting flowers and leaves for her tomorrow, amongst a few other things. I will post when I get some time. 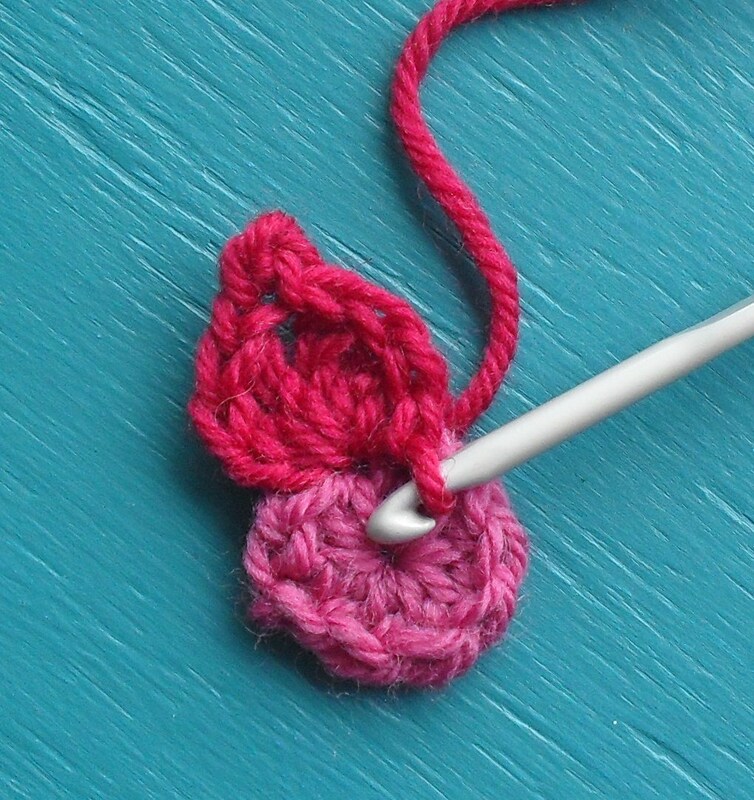 I was attempting to crochet a flower with a pointy end and just couldn’t make any sense of the pattern, so after tomorrow I will attempt to follow yours. I get a tad frustrated when it just doesn’t compute in my brain. Sometimes I need to sit and watch, or have lots of step by step pics. However I am happy with the progress thus far, 6 months ago I couldn’t even do a chain. Yippee!! So very cute! I know some little nieces that will absolutely love these. Another thing that you can do in place of the pin is to sew a button the back also. That way, if you want to put it in a button hole or through the loops of some loose crochet or knitting , you can 🙂 I do this with the scarves I make for my friends store. The little girls can button their scarf around their neck and not lose it…until they take it off. Alice, as usual you ROCK with your fabby tutorials! A million thanks for sharing. I wish I was at home now with my hook to whip up a few of things……dang this silly job getting the way. ☺ Hugs to you and the lovely Raymond! Lovely tutorial….I’ve been thinking of flowers and leaves ever since New Years so this is wonderful to find. Awesome flowers and leaves. I really like reading your blog. Your enthusiasm shows through and it is great fun to read. Thanks for sharing. I love this blog — not so much because of the patterns you post as because of your color palette. I just got obsessed with crocheting a couple weeks ago — I’m an artist whose medium (as I like to say) is color, and I’m enjoying discovering all the different designs that can be created. Your blog has given me ideas! Hi, I found your blog quite recently and love it. The flower brooch is so cute and thank you for sharing. I will be trying to make one very soon. Also wanted to say that your tea cosies are AMAZING!!! Thanks so much for posting these! I haven’t made anything of yours to sell yet but I think they would be great as you make wonderful things. If I do I’ll be sure to let you know and see if I can’t send you a pic or two. Thanks for the permission. I love your little flowers and might even make some for myself. Hug Raymond for me! Thank you for the pattern, I am going to try one today – snowed in and not thinking much of it at all! That is THE cutest flower ever! Alice thank you for this wonderful tutorial. However – as new to crocheting – I am a bit lost. I checked the American terms on this page http://www.crochethooksyou.com/crochet-stitch-conversion-chart/ and couldn’t find explanation for ‘htr’. Can you or anyone help? I had the same issue. I’m also new to the crocheting world and couldn’t find htr. can anyone explain the stitch to me? These flowers are divine and I cannot wait to master them! I was a little wary about the idea of handmade gifts all year, but with you posting stuff like this it seems more do-able! Thank you so much for providing ideas and the patterns to go with them in order to empower your readers (and in turn make the world a better place)! You are awesome! Been browsing your site and came across your veeeery enthusiastic tutorials 🙂 I’m going to have fun with these little pointy flowers right now… so thoughtful of you to post these clear directions, thank you, Alice. I love following your blog Alice!! You’re great! Just made this flower – LOVE IT!! The little points are just perfect! Thanks again for sharing your talents! Your work is beautiful Alice, very admirable. I have never been able to get my head around crochet though it has always facinated me which is funny because l’m confident with so many other crafts. Seeing your’e lovely work has inspired me to have another go. I have a friend who has offered to teach me, l only hope she has lots of patience. Yarn over, draw through two loops. Yarn over, draw through last 3 loops. I’m very very new at crocheting, but have done a few flowers. I came across your version and decided to give it a try because its so cute! But i seem to have only enough room for four petals.. Can you think of anything that might have caused it? I started with 10 stitches, so the only thing i can come up with is i shouldn’t be using one stitch from first round by itself just for the slst in the second round? Thanks! I love your blog full of inspiration! Now I realized a project with your pointy flowers, and I have a little translation of the flower pattern to German in my blog. Please let me know, if you agree with it! ADORABLE pointy flower! Thank you for the tute. I’ve been making hats to donate to charity and love adding a little something! Hi there! I used your flower pattern on top of a blueberry beanie. You can see it here: http://doahdiddy.blogspot.com/2011/06/piecing-together-blueberry-hat.html I linked back to this post. 🙂 Also, I love your prayer flags – can’t wait to make them!! You were featured on my blog: WouldYouLikeYarnWithThat.blogspot.com! Be sure to stop by and pick up your button! This is such a cute flower! Thanks for the tutorial! Those little pointies are so darn cute! I would happily sit and make heaps of them with nothing in mind but loving them! I’m into little ‘additives’ at the moment. I just have to make bigger things so I can put them on it! OMG!! I love love love love love your blog! How did I not find you sooner?! These flowers are adorable, and your whole blog is super cute and colourful! Raymond is a handsome fellow as well! (I have a creative director of my own–she likes to chew on yarn though, so she’s not a great creative director). 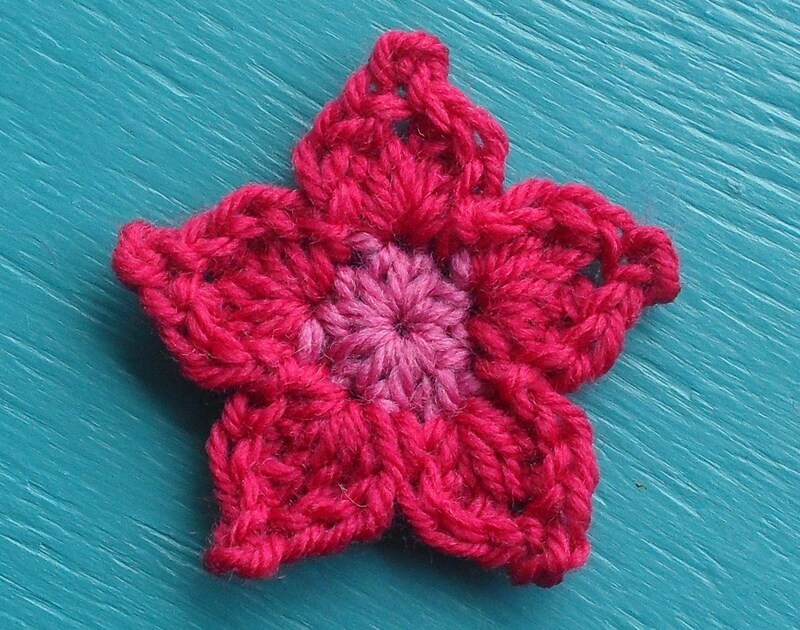 Thanks for posting such a gorgeous little flower pattern! I can’t wait to get it on my hook! These are perfect!! I’ve been commissioned to make a puppy sweater for someone and wanted to give it that extra oomph but couldn’t quite find the right pattern. These will work great!! Thank you for the free patterns! I’ll post pictures of the finished product on Ravelry once I’m finished. ^_^ User id: magdalena2113. I made one of these lovely little pointy flowers of yours, everyone just loves my new little brooch. I found a glass ladybird bead from somewhere and added it to the flower. It looks just perfect sitting among the petals. I love your blog with all your colourful wools and work, you take a simple design and make it into something special. I love the granny teacosy so much that I went searching all the charity shops in Plymouth for a teapot just so I could dress it up. Thank you for sharing the flower tutorial, I was looking for a small flower to go onto grand-daughters matching dress and cardi I have just crocheted for her! These will look great! 1) bring the second colour through one of the first round loops. – Do you mean the loops between the 9 hdc’s, or the actual stitches? – when looking up htr & hdc on you tube, they are both the same stitch? also what does (picot made) mean? please refer to the link under the header for step-by-step stitch guide, it will assist you in understanding the stitches, thank you. Just discovered you today! Love your blog! My favorite craft is crochet and I have a huge stash of yarn. I live in Maine and our winters are very long, so I pass a lot of evenings with crocheting! Thanks so very much for sharing your wonderful ideas. ~Gail H.
Can you use any type of wool to do your crochet things in, I cannot afford cotton type yarn , but I hav e baskets of acrylic yarn.Thank you for sharing , I love to crochet! they are really cute and so easy to make. You can use any type of yarn. use a smaller hook for a smaller flower. Very cute just what I needed!